The Alpala porphyry copper-gold deposit is part of a cluster of mineralised systems in the Cascabel district, ~110 km north of Quito, 20 km south of the Colombian border in far northern Ecuador, and ~65 km to the NE of the Llurimagua/Junín deposit (#Location: 0° 45' 13"N, 78°: 19' 54"W). 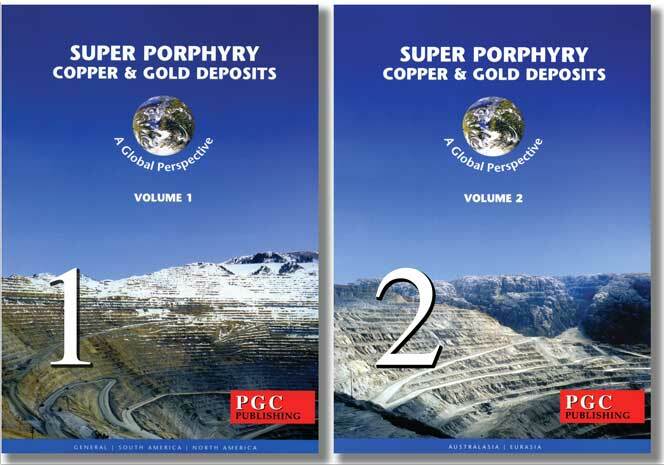 For detail and geological/tectonic diagrams showing the regional setting and geology of the northern Andes, Ecuador and the Cascabel District area, see the separate records for North Andes copper-gold province in Ecuador and the broader North Andes and Panama copper-gold province. Regionally, the Cascabel District lies within the Western Tectonic Realm of the Northern Andes (Cedial et al., 2003) and within the western foothills of the Cordillera Occidental of northern Ecuador. The Western Tectonic Realm comprises two composite terrane assemblages in northern Ecuador and Colombia, the Pacific Assemblage and Caribbean Terrane. The composite Pacific Assemblage terrane is, in turn, divided into three sliver-like terranes, from east to west, the: i). Romeral, ii). Dagua-Piñón and iii). Gorgona terranes. The Dagua-Piñón Terrane is correlated with the Piñón and Macuchi terranes of western Ecuador. All litho-tectonic terranes of the Western Tectonic Realm are composed of fragments of Pacific oceanic plateaus, aseismic ridges, intra-oceanic island arcs and/or ophiolites. All were developed in or on oceanic basement and all are allochthonous with respect to continental South America. The Pacific Assemblage and the Romeral Terrane contain ultramafic complexes, ophiolite sequences and oceanic sedimentary rocks of probable Jurassic to Early Cretaceous age. The Romeral Terrane extends southward from Colombia into Ecuador where it underlies the western margin of the Cordillera Real and much of the Inter-Andean Depression that is overlain by extensive Miocene, Pliocene and Recent volcanic cover. The Inter-Andean Depression separates the Cordillera Real to the east from the Cordillera Occidental in the west. The Dagua-Piñón Terrane, lies to the west of the Romeral Terrane and underlies the Cascabel district which is found on its eastern margin. It is dominantly composed of basaltic rocks of tholeiitic MORB affinity, and sequences of flyschoid siliciclastic sediments (including chert, siltstone and greywacke), and is interpreted to represent accreted fragments of oceanic crust, aseismic ridges and oceanic plateaus. The Dagua-Piñón Terrane is intruded by several I-type calc-alkaline batholiths and plutons distributed over much of its length. These range from tonalitic to granodioritic in composition and are of Paleocene to Miocene age (Cedial et al., 2003). These plutons are related to the porphyry-style mineralisation within the Dagua-Piñón Terrane, including the Llurimagua/Junín and Cascabel/Alpala porphyry copper deposits. The Gorgona Terrane occurs immediately to the west, predominantly offshore, and comprises a more recently accreted oceanic plateau. These terranes/assemblages are separated by NNE trending crustal-scale faults or sutures, dominantly exhibiting strike-slip displacement. In the Cascabel district, the principal terrane boundary structure is the Cauca-Pujili fault system which separates the Romeral and Dagua-Piñón terranes. This is a major structure which, in detail, is composed of multiple strands, several of which pass near or through the Cascabel district. The Toachi Fault on the northwestern margin of this composite structure, is sub-parallel to the main Cauca-Pujili Fault Zone and runs through the Alpala-Cascabel deposit area. To the north in Colombia, the Cauca fault system is well exposed for much of its length, and is observed to have a dextral strike-slip displacement. In Ecuador this structure is only poorly exposed, largely being masked by Pliocene and Quaternary volcanic and sedimentary cover in the Inter-Andean Depression. However, to the SW of Quito in northern Ecuador, the occurrence of ophiolite along the extension of the Cauca fault zone (where it is known as the Pujili Fault) indicates its role as a major terrane suture. Subduction-related calc-alkaline tonalitic to quartz dioritic magmatism intruded the Dagua-Piñón Terrane between 44 Ma and 13 Ma (Eocene to Miocene) as the Piedrancha, Rio Santiago, Apuela, Anchicaya batholiths and the Arboledus Stock. The most significant of these is the 40 x 30 km Apuela Batholith which sits astride the Toachi fault and 40 km to the SW of Alpala, with an intervening smaller 20 x 5 km, NE-SW elongated pluton. The Apuela Batholith comprises a nested series of intrusives that include quartz porphyry, granodioritic porphyries and diorite porphyry, all of which are different intrusive facies of the larger composite batholith. Similar intrusions occur within the Romeral Terrane forming the Suarez, Piedrasentada and San Cristobal plutons in southern Colombia. This magmatism is characterised by the absence of a well-developed arc, with erratic pluton distribution, taken to imply low-angle subduction. A general eastward migration of magmatic focus from the Dagua-Piñón to the Romeral Terrane, is interpreted to reflect the final approach of the Gorgona oceanic plateau as subduction progressively shallowed due to the increasingly buoyant nature of the progressively thicker crust entering the subduction zone. Batholiths to the NW of the Cauca-Pujili Fault Zone and the Toachi Fault are interpreted to be of Mesozoic age and may have been emplaced in the Dagua-Piñón Terrane prior to its docking with the mainland. The oceanic, sliver-like Romeral, Dagua-Piñón and Gorgona terranes that were mostly too thick to subduct, obliquely approached the South American plate from the SW and were progressively accreted during the mid to late Mesozoic and early Cenozoic. In addition to the transpressive compression related to the docking of these terranes, more recent ongoing tectonic compression is related to the shallow buoyant, post 8 Ma subduction of the Carnegie Ridge, whose eastward subducted projection is interpreted by Gutscher et al. (2003) to extend beneath the Ecuador-Colombia border and underlie the area of the Cascabel District. The bulk of Ecuador's porphyry Cu±Mo±Au±Ag and porphyry-related epithermal Au±Ag±Cu deposits are of Jurassic and Tertiary (mostly Miocene, and lesser Eocene) age, that define two distinct and parallel, temporal metallogenic belts to the east and west respectively (PRODEMINCA 2000; Sillitoe and Perelló 2005; Chiaradia et al., 2009). 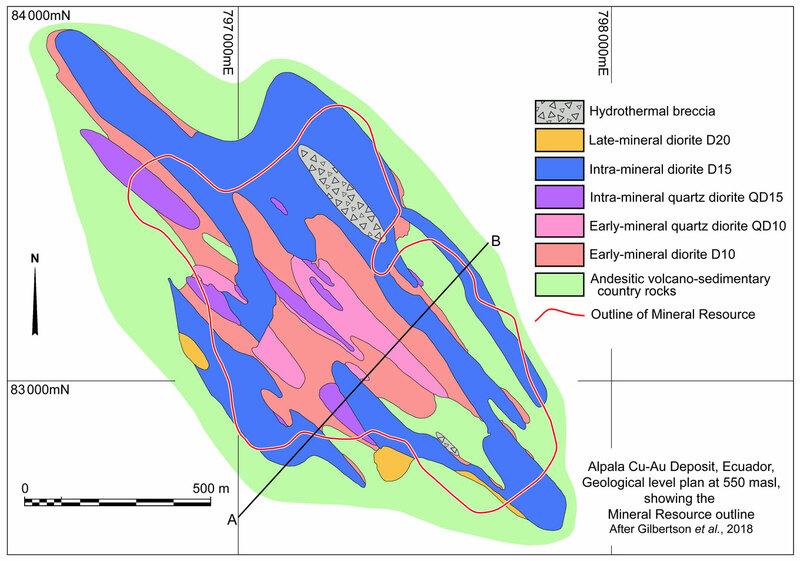 Alpala is one of a number of porphyry and epithermal deposits that form two main geographically separated mineral districts within the broader Tertiary metallogenic belt that follows the western Andean range or Cordillera Occidental. The southern of these, the Azuay-El Oro District, is defined by a series of Miocene porphyry Cu-Mo, Cu-Au and high, low and intermediate sulphidation epithermal copper-gold deposits and prospects ~200 km SSE of Guayaquil in southern Ecuador. The Imbaoeste District, ~440 km to the north, includes the Eocene Alpala/Cascabel porphyry Cu-Au and Miocene Llurimagua/Junín porphyry Cu-Mo deposits. Llurimagua/Junín is 65 km SW of Alpala. Other indications of mineralisation in the area include the Cuellaje Pb-Zn-Ag occurrence and the El Corazon epithermal Au-Ag-Cu vein system and associated siliceous hydrothermal breccias which are located 12 km east and 14 km WSW of Llurimagua/Junín respectively. The Rio Amarillo Au-Ag-Cu occurrence related to epithermal veins and porphyritic intrusions with an associated Cu skarn is situated 22 km SE of Alpala, while a number of other prospects have been identified between the two (Gilbertson et al., 2018). The Llurimagua/Junín deposit and Cuellaje occurrence are hosted within the Miocene Apuela Batholith, whilst Alpala is within a block dominated by the tholeiitic to calc-alkaline andesitic volcaniclastics rocks of the Oligocene to mid-Miocene San Juan de Lachas Formation. Other deposits and occurrences are distributed along the Tertiary porphyry belt between these two districts, and to the north into Colombia and SE into Peru. The Alpala deposit lies along the NE-SW trending crustal scale Toachi Fault Zone and is hosted by diorite and quartz diorite stocks and dykes. These stocks and dykes intrude a sequence that is underlain by basement tholeiitic MORB basalts of the Dagua-Piñón Terrane, which were progressively overlain by Palaeocene to Eocene submarine volcanosedimentary rocks of the Macuchi Volcanics along the Macuchi Volcanic Arc in northern Ecuador, followed by sedimentary rocks of the Eocene Tortuga Formation and then by emergent andesitic volcanic breccias that formed the Oligocene to mid-Miocene San Juan de Lachas Formation. The principal host sequence at Alpala comprises andesitic volcaniclastic rocks of the Macuchi Volcanic Arc intruded on the northern side of the Toachi Fault by a series of relatively small to modest sized stocks and dykes. These intrusions, together with the abundance of andesitic pyroclastics, suggest the relics of an andesitic stratovolcanic centre are preserved in and around the Cascabel District, NW of the Toachi Fault. In contrast, to the south of the Toachi Fault, the intrusives are more extensive and this suggests that deeper erosion has exposed the batholith to deeper levels and that there may be a differential level of erosion to the NW and SE of the Toachi Fault. Structural mapping and interpretation of more regional Digital Elevation data reveal a series of four major second-order NW-SE trending structures which appear to exhibit important controls on mineralisation both at Alpala, where they control the northwest-trending zone of argillic alteration, and also further south where regional stream sediment Au anomalism appears to be crudely controlled by northwest-trending structures. Third-order NNW-trending structures may also play an important role in localising mineralisation. The Tortuga Formation is the oldest exposed sequence in the deposit area and comprises sedimentary rocks of inferred Eocene age that outcrop SW of the Alpala deposit where they comprise interbedded shale and greywacke (Graves, 2012). Equivalent units are observed elsewhere in the district, and locally interdigitate with the lower parts of the San Juan de Lachas Formation. In the deposit area, the San Juan de Lachas Formation comprises argillic to propylitic altered andesitic to locally basaltic-andesitic volcaniclastic breccias, forming a thick, poorly differentiated sequence. The breccias vary from coarse lithic tuffs to finer lapilli and crystal tuffs that dip gently NE. The breccias are strongly fractured in proximity to intrusives. According to Rohrlach et al. (2015), several intrusive phases are evident in the area surrounding the deposit, the most prominent of which is a 5 x 2 km diorite porphyry stock that outcrops extensively to the north of Alpala, but forms discrete, high-level apophyses occurring as dykes and stocks penetrating the andesitic volcaniclastic country rocks in the south, straddling Alpala. The exposed stocks range from dioritic to quartz dioritic to dacitic in composition (Rohrlach et al., 2015; Coote, 2014). Quartz-diorite and microdiorite to tonalite are the dominant intrusive types, all of which exhibit porphyry-style alteration and stockwork veining in the Alpala deposit. An ~5 up to 400 m wide by ~3 km long, late-mineral, NNW trending hornblende-rich diorite occurs to the north of the main Alpala porphyry system. Younger, probable Quaternary age perched conglomerates cover the host rocks north of Alpala. Gilbertson et al. (2018), describe the intrusive complex in more detail as follows. The mineralised bodies at Alpala form a roughly NW trending porphyry cluster associated with a northwesterly-trending, steeply NE dipping, dyke and stock complex of diorite to quartz diorite intrusions that extend for more than 1900 x 800 m and exceeds 1800 m in vertical extent. • The D10 sub-porphyritic to fine to medium diorite to microdiorite represents the first phase of intrusive activity cutting the volcanic country rocks. It follows steeply dipping NW, NNW and less commonly, NE orientated fault networks, resulting in a predominantly NW trending intrusive mass. This intrusion is interpreted to be pre-mineral, although it contains significant widths of mineralisation related to younger overprinting activity. The D10 stocks and dykes are cut by the later phases which occur as more extensive masses at depth that split into upward tapering fingers and dykes. • The QD10 porphyritic quartz diorite occurs as dyke-like masses, following the same structural network as the D10 intrusions, cross cutting or 'jacking' the latter apart. They are best developed and thickest in the core of the deposit at depths of ~1400 m below the surface, above which they forms dyke extending upwards. This quartz diorite has been identified as an early-mineral phase and is the main copper and gold bearing lithology that has yielded the highest grade drill intersections. 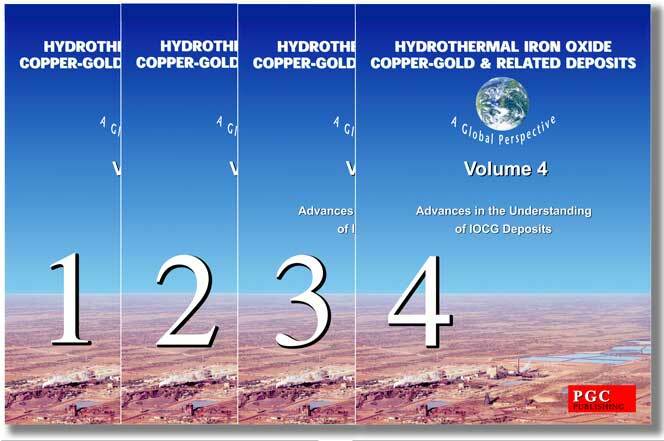 • The D15 stock and QD15 dykes are intra-mineral intrusions. D15 is a fine grained diorite, whilst QD15 is a porphyritic quartz diorite. Although they have been interpreted to have only introduced minor quantities of mineralising fluids into the system, both the D15 and the QD15 may have been responsible for significant remobilisation of pre-existing mineralisation. 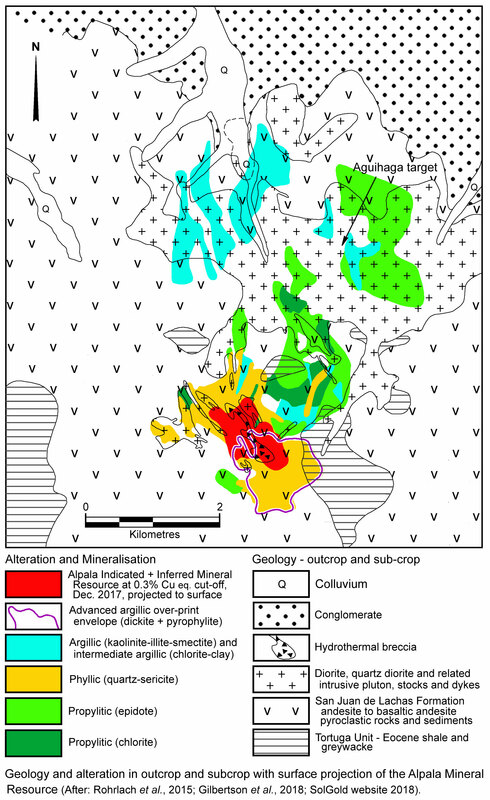 The intra-mineral D15 diorite is the most widespread intrusive lithology at Alpala and forms an extensive plutonic stock at the base of the deposit with multiple finger-like apophyses persisting into the shallower levels of the deposit, significantly disrupting the continuity of the mineralised D10 and QD10 intrusions. • The D20 and QD20 are late-mineral porphyritic diorite and porphyritic quartz diorite stock and dyke intrusions that have not been found to carry any significant grade, and postdate and cross cut the main phases of mineralisation. • A series of barren late stage post mineralisation intrusions have also been identified as well as an extensive NW-SE oriented zone of hydrothermal brecciation along the NE flank of the deposit. Minor mineralised intersections have been identified within the breccia, although these are attributed to clasts of transported mineralised diorite incorporated into the breccia. Geological mapping as well as topographic and geophysical data suggest the intrusive centres are aligned at the intersection of NW trending deep seated structures and NE and north-trending structural corridors that cross the Cascabel district. Veining is also aligned parellal to these same trends, while the elongate nature of the Alpala intrusions follows the first of these trends. The central core of the deposit is offset in a north-easterly direction again suggesting that Alpala Central is located at a junction between the NE and NW structures. Late stage post mineral D20 diorite dykes also intrudes along the NE trend. Porphyry Cu-Au mineralisation at Alpala occurs along the SW margin of a deep (top at ~800 m) 1100 x 500 m magnetic core caused by primary magnetite in intrusions and a substantial development of hydrothermal magnetite as veins and disseminations in association with chalcopyrite and lesser bornite in sheeted and stockwork veins. Above this core, high-grade porphyry Cu-Au mineralisation occurs along the transition zone between an inner potassic (biotite) assemblage and a marginal, epidote- and actinolite-bearing and magnetite-rich high temperature propylitic zone. Minor relict hydrothermal biotite is recognised in thin-section where it is pervasively overprinted by chlorite at deeper levels and by retrograde phyllic and intermediate argillic assemblages at shallower levels. At surface there is a 2.5 x 1 km acid lithocap, composed of illite (phengite) alteration surrounding two main cores of kaolinitic argillic alteration, the northern of which encloses a zone of pyrophyllite, while the southern surrounds smaller zones of pyrophyllite and dickite. This lithocap is enclosed within a more extensive and diffuse zone of muscovite, with patchy internal and marginal Fe-Mg chlorite and an irregularly developed outer rim of Mg-chlorite. A structurally controlled, 4.5 x 9 km, NNW trending argillic zone surrounds and overprints the main illite-kaolinite trend and the more extensive and broader north-south trending muscovite and chlorite zones. Within the ore deposit and its halo, hydrothermal and primary magnetite is variably to pervasively oxidised to hematite within shallower feldspar-destructive clay alteration assemblages, whilst chalcocite is encountered near surface within the lithocap. The absence of enargite is interpreted to reflect erosion of the lithocap. Up to 11 morphological generations of veining have been identified, although most of the recognised Cu and Au mineralisation intersected to 2015 is associated with B-veins and C-veins, with chalcopyrite-rich C-veins commonly re-opening existing B-veins. Some Cu occurs in transitional C-D veins (intergrown chalcopyrite-pyrite with bleached selvedges). Minor bornite is found in high-grade intersections and appears to increase at depth and northeast of the NW-trending footwall structure (Rohrlach et al., 2015). • Late anhydrite veining followed by calcite and base metal veins (±calcite and/or anhydrite). • The QD20 stock and dyke intrusions have a similar vein content to D20, accompanied by phyllic and intermediate argillic assemblages. Prograde potassic biotite alteration is largely associated with the older D10 quartz diorite and QD10 quartz diorite porphyry, and is masked by structurally controlled retrograde hydrothermal, thermal and metasomatic overprinting, and by hornfelsing/metasomatism of mafic to intermediate volcanic/volcaniclastic rocks. Where B-type vein densities are sufficiently high, sericitic (illitic) vein selvages merge and result in the entire rock mass being argillic-altered, completely overprinting precursor potassic assemblages, or chlorite-epidote characteristic of any high temperature propylitic alteration. Hydrothermal A- and B-type quartz veining associated within the D15 and QD15 porphyritic rocks extends into the thermally and metasomatically overprinted early diorite and quartz diorite porphyry intrusions, and into hornfelsed/metasomatised volcanic/volcaniclastic rocks (Applied Petrologic Services and Research, 2014). All rock types have been subjected to late, carbonate-rich, retrograde hydrothermal overprinting and quartz-bearing D-type veining and carbonate-rich veins. Copper mineralisation in all lithologies is petrologically interpreted to be of magmatic hydrothermal to retrograde hydrothermal in origin. In contrast molybdenum mineralisation is only identified as late magmatic hydrothermal in paragenesis, whereas gold is solely interpreted as retrograde hydrothermal (Applied Petrologic Services and Research, 2014). The earliest formed sulphide mineral is bornite in B-type veins. Chalcopyrite is usually formed after, and surrounds, cubic and massive pyrite in B2, C- and D-type veins. It is also found in anhydrite-rich veins and B-type veins that have been re-opened by later vein types. Late bornite is in textural equilibrium with pyrite and chalcopyrite in C- and D-type veins, suggesting these later-stage veins formed at a lower temperature and a higher sulphidation state than chalcopyrite in early B-type veins (Einaudi et al., 2003). The bulk of the copper mineralisation occurs within the B-type veins, with chalcopyrite rich C-type sulphide veins containing accessory bornite, and are likely associated with elevated gold grades. The intensity of mineralised veining is stronger inside of, and peripheral to the coeval intrusions, but is also strong near the steep dipping structures that provided the original pathways for the intrusions and continues up these structures for some distance above the apices of the dykes (Gilbertson et al., 2018). Mineralising fluids are interpreted to have been introduced during the emplacement of the QD10 and to a lesser extent the QD15 intrusives, defining two broad mineralising events. 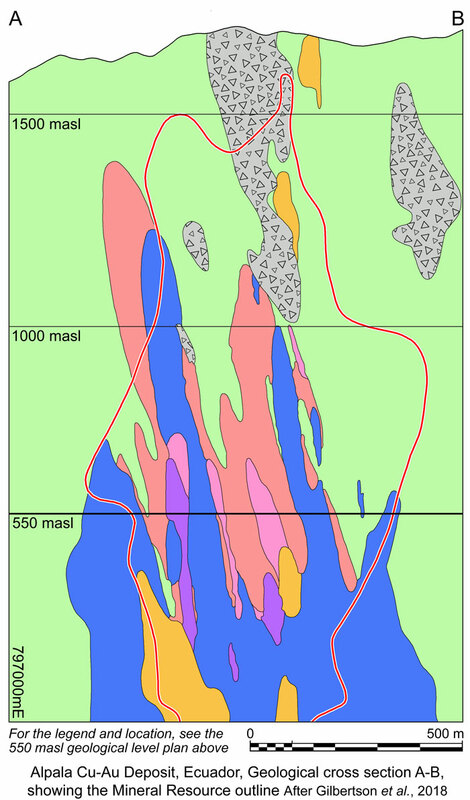 The density of B-type veins is closely related to the distribution of grade within the ore zone, emphasising their importance to the development of the ore deposit. In high-grade drill-core, the Cu (%) to Au (g/t) ratio is close to 1:1, whilst at lower grades there is a tendency for Cu to dominate over Au. Better intersections encountered during early exploration and proving drilling include: 1306 m @ 0.62% Cu, 0.54 g/t Au from 24 m depth, including 672 m @ 0.93% Cu, 0.91 g/t Au from 658 to1330 m; and 50 m @ 1.80% Cu, 2.26 g/t Au from 1096 to 1146 m.
Stockwork veins exposed at surface are strongly oxidised, although relic sulphides are observed in some samples. Below the zone of oxidation, B- and C-type veins are spatially associated with intrusions that show variable feldspar destructive, sericite-chlorite-clay overprinting of biotite-actinolite and chlorite-epidote alteration mineral assemblages. Late-stage, pyritic anhydrite is a common vein constituent as it is deposited over a wide range of temperatures and re-opens earlier vein stages. 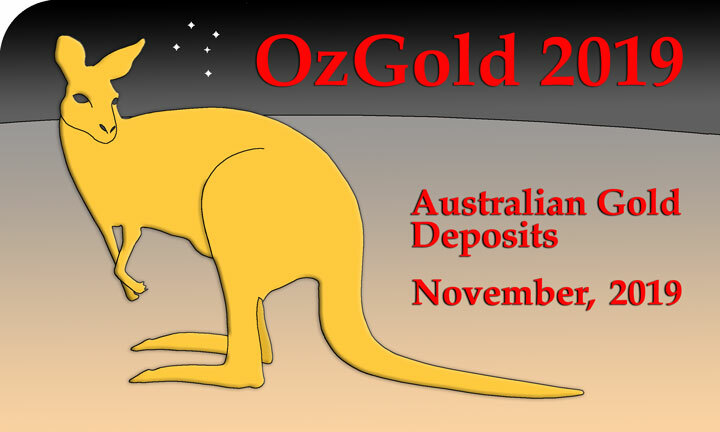 TOTAL high grade core resource - 120 Mt @ 1.1% Cu, 1.3 g/t Au, 1.8% Cu Equiv., containing 155 t of Au. TOTAL Mineral Resource - 1080 Mt @ 0.44% Cu, 0.34 g/t Au, 0.68% Cu Equiv. containing 375 t of Au. TOTAL Mineral Resource - 2950 Mt @ 0.37% Cu, 0.24 g/t Au, 0.52 % Cu Equiv. containing 712 t of Au. This resource does not apparently encompass all of the deposit, and is expected to increase with further step out and infill drilling, and testing of adjacent satellite deposits, one of the more promising of which is Aguinaga, ~3 km to the NE of Alpala. This summary is largely derived from Rohrlach et al., 2015 and "Gilbertson, J., Pittuck, M. and Wills, J., 2018 - A Technical Report on the Maiden Mineral Resource Estimate for the Alpala Deposit, Ecuador; an NI 43-101 Technical Report prepared for SolGold PLC and Cornerstone Capital Resources Inc., by SRK Exploration Services Ltd, and submitted to the Toronto Stock Exchange, pp. 1-2, 27-41."